Riding on the success of Bernard Prince in Tintin magazine, the team of Hermann and Greg created a new adventure strip in 1971 entitled Comanche. This solid Western story revolved around a beautiful female ranch owner, Comanche, who faithfully ruled over her ranch hands named Red Dust, and his older crotchety sidekick called Ten Gallons. Rounding out the cast was a wise black cowboy, Toby, and a callous youth who often drank too much at Red Dust's feet who went by the moniker, Clem. Well written and meticulously researched, the stories were often overshadowed by Hermann's striking visual style loaded with lavish excessive detail. Trying hard at times to emulate the popular Lieutenant Blueberry, Hermann and Greg could match the realism and skill in draftsmanship, but never quite accomplish the same pace in the narrative. 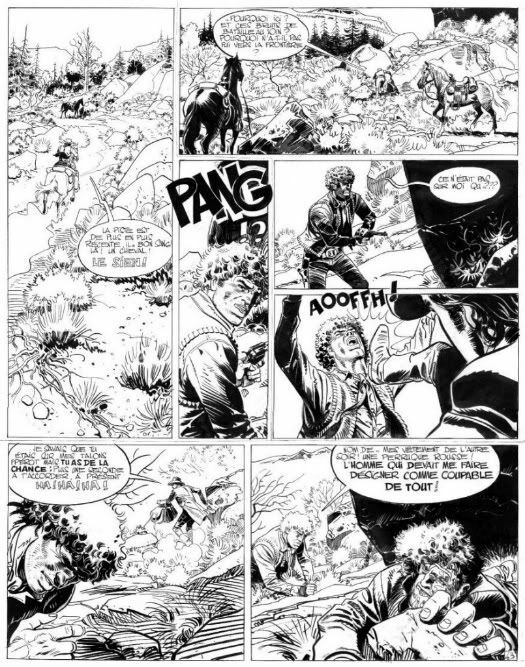 Still no one can argue that Comanche was one of the highlights of the adventure strip genre in the 1970's, so reprints were bound to happen from Belgian's Editions du Lombard in book form soon after its debut. 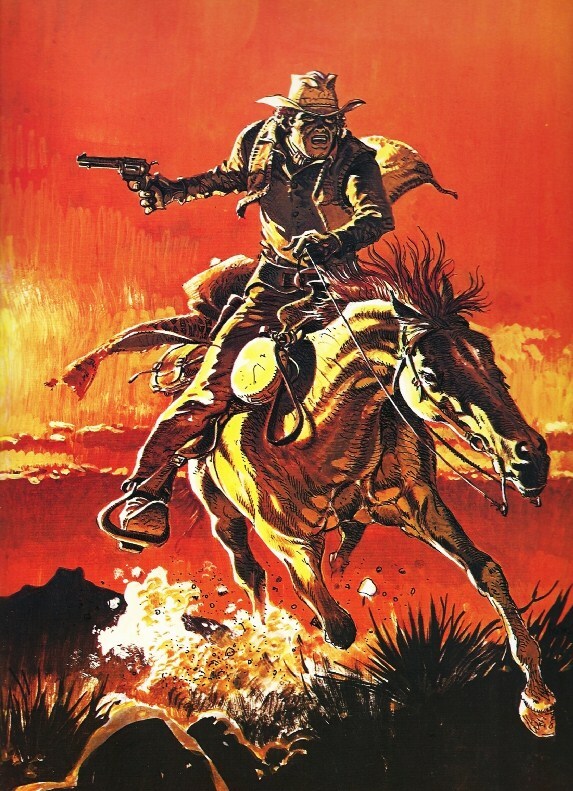 When Hermann quit drawing Comanche, the strip was taken over by French artist Michel Rouge. The page shown here is by Rouge. Thanks for the information, he is a wonderful artist!